Photos: Suhana Steals The Show At Gauri Khan's Halloween Party! Home BOLLYWOOD Photos: Suhana Steals The Show At Gauri Khan’s Halloween Party! Photos: Suhana Steals The Show At Gauri Khan’s Halloween Party! Shah Rukh Khan’s daughter Suhana Khan looks like a diva in that golden outfit at Gauri Khan’s Halloween bash. The Bollywood superstar Shah Rukh Khan’s daughter Suhana Khan is no less than a star now. Wherever the young pretty lady goes, she attracts eyeballs, and people just can’t stop talking about her. Lately, her pictures have been going viral on the social media platforms. And guess what! There’s one more look of the girl which has gone viral. It is from her mother Gauri Khan’s Halloween bash which was held last night. 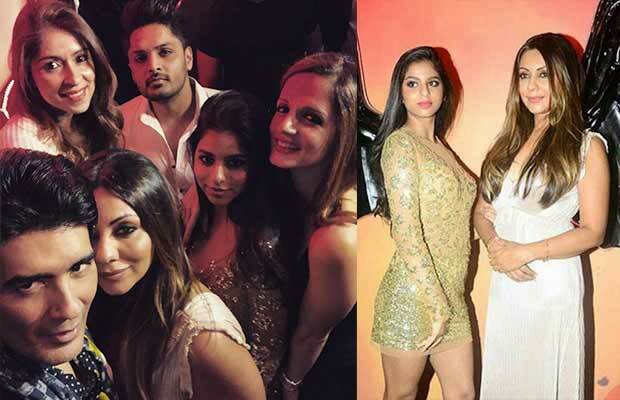 As Suhana is in the town for a small holiday, she too attended the star-studded party. The girl just looked divine in that golden outfit paired with golden high heels. She had left her hair open which did nothing but just add to her beauty. It was once again that the girl stole the show! The party which was held at the Taj Lands End, saw the presence of many B-town celebs like Malaika Arora, Seema Khan, Arbaaz Khan, Sanjay Kapoor, Sussanne Khan, Ileana D’Cruz. Also present were Manish Malhotra, Sushant Singh Rajput and Sana Khan. It is not for the first time that Suhana stole the limelight at an event. Earlier also, there were several parties where people were just looking at her. For instance, Gauri Khan’s restaurant launch where Suhana appeared in that orange dress. Or Salman Khan’s Tubelight screening, where she was looking stunning. The girl already has a huge fan base and they are just waiting for her to make her Bollywood debut soon. But as already made clear by her father Shah Rukh she needs to complete her education first, before she could start working. Well, we guess that there is still some time to see Suhana on the big screen! The big dark wings couldn’t have slayed it better????♥️??? ?Halloween weekend #birthdayfuncontinues #cirquedesoir #mydarlingG #foreverwithyou♥️?full power to u! ????? Previous articleBigg Boss 11: Shocking! FIR Filed Against Priyank Sharma And Sapna Choudhary Over Arshi Khan’s Legal Case! Next articleBigg Boss 11: Find Out All About Arshi Khan’s Pune And Goa Scandal!